May 20 is the first anniversary of Everybody Draw Mohammed Day, which was conceived by Seattle illustrator Molly Norris to champion free speech but became yet another symbol of its curtailment. Professor and commentator Karen Lugo has urged Americans to remember Norris as "inspiration in our cause to never accommodate threats of retaliation for exercising our fundamental liberties." Islamist Watch does its small part by revisiting the Norris affair below. Bloodthirsty Islamism. 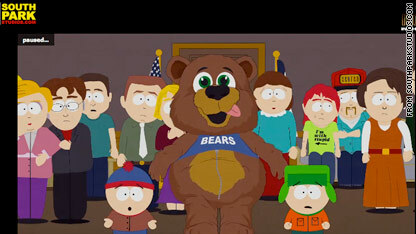 After the April 14, 2010, episode of South Park parodied self-censorship by depicting Islam's prophet dressed in a bear costume, a radical group known as Revolution Muslim responded with thinly veiled threats cautioning the show's creators that they would "probably wind up like Theo van Gogh," the slain Dutch filmmaker. Groveling capitulation. Comedy Central, the network that carries South Park, quickly proved the show's point. It censored the follow-up episode by placing black boxes over images of Muhammad and bleeping utterances of his name. Fear and hesitancy. Dismayed by Comedy Central's actions, Norris created a poster, with anthropomorphic household items claiming to be true likenesses of Muhammad, to advertise a fictional event in which everyone would sketch him on May 20 to "water down the pool of targets." When the idea went viral, Norris got spooked and distanced herself from her own art, but countless websites followed through on the concept. Government and media fecklessness. Soon after cleric Anwar al-Awlaki placed Norris on an assassination list, Seattle Weekly reported in September that "there is no more Molly" because an FBI warning had prompted her to leave her job and go into hiding — "without the government picking up the tab" for her protection. So much for defending free speech. Equally alarming, most mainstream media organs expressed little outrage over the plight of Norris, preferring instead to drop the issue down the memory hole. In short, the events surrounding Everybody Draw Mohammed Day are a microcosm of how freedom slowly dies. Only by familiarizing ourselves with this process and comprehending its impact on real human beings can we gather the intellectual and moral resources necessary to keep others — and ultimately Western civilization itself — from sharing this cartoonist's unhappy fate. That is precisely why we must remember Molly Norris, today and every day.